Skin weft hair extensions is also named handtied tape in hair extensions, PU weft hair extensions etc., which is one kind of hair extensions handtied hair on transparent PU. What you seen on this page is Indian virgin remy hair handtied skin weft tape hair extensions, which Indian virgin remy hair has longer life than regular Indian remy hair. Handtied skin weft hair extensions looks like the hair grown from your own scalp but skin weft hair extensions's hair density is not good as regular tape in hair extensions. But there are many ladies like this kind of handtied skin weft hair extensions. Hera not lonly supply Indian virgin skin weft hair extensions, we also wholesale Brazilian virgin skin weft, Malaysian virgin skin weft, European virgin skin weft, Chinese virgin skin weft and we also can do Chinese cuticle skin weft hair extensions. As professional skin weft hair extensions factory, we can do any custom change according to your market requirement. 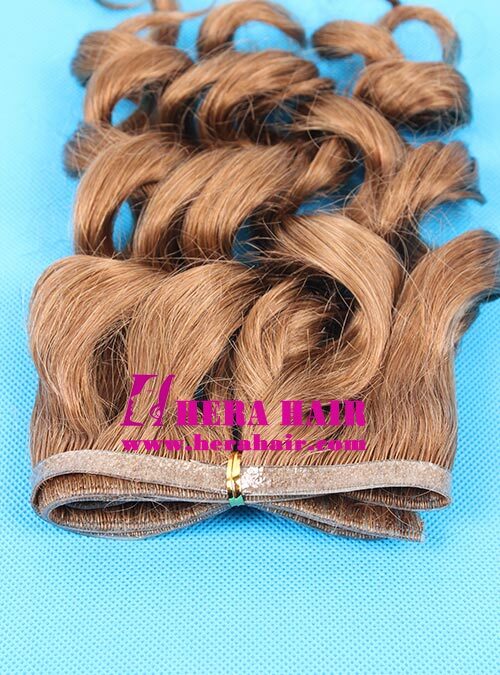 If you have any requirement about handtied skin weft hair extensions, please send your inquiry to sales@herahair.com .